It’s been a busy few weeks rounding out the end of what I would say was a very productive and successful “off-season”. I just got back to Örebro, Sweden where I play professionally, and couldn’t be more excited and ready to get this season underway in just a few weeks time. 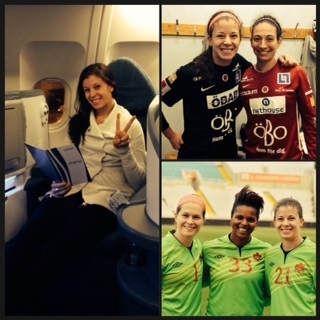 After finishing a 4 month “residency” with the National Team, in mid-February, I flew to Sweden for a much anticipated and very important game vs last years league champions Malmö. The game was the quarter final for the Swedish Cup, which is a tournament that goes on throughout the year along-side the league to find the “best team in Sweden”. Not always the same team that wins the Damallsvenskan (highest league). Every team in Sweden starts out in the single-game knockout tournament, with the Damallsvenskan teams joining in during the later stages. We had a tough draw for the quarters, playing last year’s league champions away, but knew we were up to the challenge. After arriving in Örebro, unpacking all my stuff for the year in one night, then repacking in the morning for Malmö and Cyprus (where I would leave for straight from Malmö for National Team duty) it was off to practice then travel down south. It was so great to be back with the team, meet our new players for the year, and catch up with old teammates from last year. The game went great, with some really good moments for both teams. We came out strong and put our mark on the game early. Going into the locker room at half time up 1-0 felt great, but we knew the second half would be extremely important. Malmö came out fighting, and took control of the second half putting us on our heels for a lot of it. We kept fighting, working hard on defense and pushing forward in our moments. Malmö finally found an equalizer on a free kick later in the game and just when it looked like it would be heading into overtime, one of our forwards capitalized on a miss back-pass from a Malmö defender to seal the game with only seconds remaining. It was such a great feeling when the final whistle blew and we knew what we had just done. Knocked out last years league champions, and at the same time sent out a clear message to all the other teams in the league that we mean business this year, and we are ready for the challenge! After all the travel, packing, jet lag, and a high intensity game, I felt like curling up in a ball and taking a nap right on the field after the game! All my energy was sucked right out of me, but at the same time I just could not stop smiling! After a nice night in Malmö and catching up with friends it was time for the airport again to head south to Cyprus to meet with the Canadian National Team. The Cyprus tournament went well, not the end result we were expecting and hoping for, but a lot of great experience and learning’s we will take forward with us. Tournaments are always fun, and great to be able to play so many games, but along with that comes a lot of hard work off the field to be able to prepare, play, recover, prepare, play on repeat. You have to find a way to learn and move on from games, in order to perform in the next without still dwelling on negatives or being up in the clouds from the positives. All in all, it’s more experience in the bank for us and another step on the road to the World Cup in Canada next year. I am back in Sweden now with KIF Örebro where I will be for the year, and I cant wait to step back on the field with the girls after I take a few days of rest this weekend to be fully prepared mentally and physically for the last weeks of preseason!